It was a rainy Chicago afternoon and evening, on a Spring day in May. They’d come from all over the United States and the World. Views and opinions as diverse as their points of origin. Powers of observation and writing never before brought together were no in one place, on one busy block. Who were they? Superheroes? Power brokers? Yes! They were Bloggers! And they came to take Chicago! Well, not actually that last part, but it sounds better yes? SOBCon08 had drawn bloggers of all types. Bloggers of politics mixed with technology bloggers as well as mommy bloggers. Each brought with them not just a desire to learn and be engaged for the weekend, but they came to share, to support, and to blog. They came to take blogging up a notch. Liz Strauss and Terry Starbucker assembled a crew of presenters for a human scale event and it was powerful. Chris Brogan, Anita Bruzzese, Chris Garret, David Bullock, Terry Starbucker, Brian Clark, Lorelle VanFossen, and Wendy Piersall talked and presented on blogging and business throughout the weekend. More than that, they shared deeply about blogging and themselves. Each poured out tips, tricks and heart during their presentations and off-stage as well. The SOBCon08 weekend was jam packed with business and blogging information, but also with fun and friends making. Shashi Bellamkonda and I have been online friends for most of year but had never met. Leave it to a blogging conference to us together. Rick Mahn and I had also been online only contacts for quite a while, this weekend allowed us to share a great experience and become real friends. There was the boat ride, where I took this skyline shot, and enjoyed the music of Christine Kane, and the wonderful dinners with my blogger friends. Did I take anything away beyond that? More than I can absorb. On the mental and supportive side, I realized I’m not alone out there, and these other bloggers, even the most successful ones, are only an email away. I realized others, yes those big name ones too, struggle at times with their blogs and their businesses. The support and encouragement doesn’t end with the weekend. Becky McCray has organized some of us into a biz and blog support and mentoring circle. As part of the take away from the SOBCon08 conference, I’ll be changing up things on the blog. It’ll be slow at first, but hopefully the improvements will be noticeable both to readers and to me. Also, I’ll be formulating some business plans, goals and more. Don’t think either that I’ll try to work in solitude. You, the readers, and you, my fellow bloggers and biz folks, will be on the spot. I’ll be asking you for guidance, reassurance, and support because of the respect and appreciation I have for you all. In summary, the weekend brought me more than I expected, and I can’t express enough in blog posts even how much so. While I make some attempts here though, I’d love to hear from you. 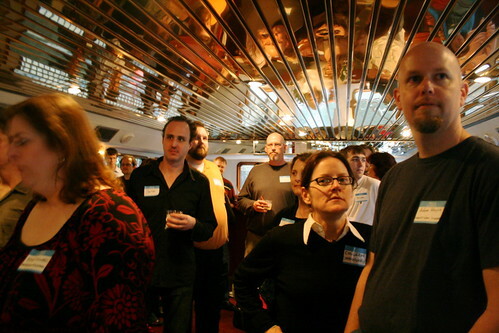 How did SOBCon08 impact you, your blogging and your business? What will you change? Or have you been to another conference recently that made a significant impact on your life? Tell me about it! I want you to share here, on your blog, or drop me a line. Don’t blog? I’ll be happy to post your story here. Come, tell us about your experience. Several of us from SOBCon08 went in search of a restaurant on Saturday evening. What we got was an experience. Wow! That’s the first word that comes to mind about Vong’s. To the left you’ll see my dinner, Panang Chicken. But that’s not where it starts, nor ends. Let me tell you more. After a short wait, we were lead back to a table with plenty of room for the eight of us, and Dawud is no small guy. Menus were handed out and water served but then we all kind of sat there. Oh, we were doing the normal pre-dinner chatter you’d expect of bloggers, but none of us could really decide what to get. Thai food has differing tastes at each restaurant, and no one was quite sure what to order. That’s when the real experience began. Then he showed up, Jose, the best waiter in Chicago. Jose began with a simple introduction and a hearty welcome to Vong’s. He then told us with obvious pride of the unique food style of the restaurant, and even some history. While doing that, Jose began describing some of the food choices, starting with the seafood curry. As he continued, he not only told us that they had seafood, but what type of crabs, and how wonderfully fresh and tasty they were. That was when it got better. Jose gave us a tour of items on the menu from appetizers to main dishes, and house speciality. With each dish, he had us more rapt. Our eyes followed along in our menus as he went through them, and our mouths began to water. He talked of curries and spices, of dinners and drinks, and we sat in silence, our whole attention focused on him. Soon enough he was done and we were all ready to chow, even Dawud and Adam, both of whom weren’t really hungry when we came in. Jose finished up by not walking off and letting us stew but visited with some of us one on one to help us choose something just right for us each. As if my mouth wasn’t watering already, the Jose told me about the Panang Chicken. 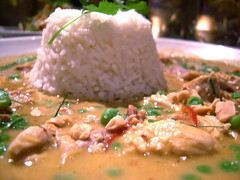 He described in earnest the peanut curry, it’s taste, texture, and spice. It is the house curry, and he was obviously quite proud of that. I was sold in a minute. Jose didn’t leave us too long at any point during the dinner, which came very quickly. Each meal was hot and they were all served together. Our drinks were never empty and the conversation over dining flowed wonderfully. It was already one of my best dining experiences in ages. And then it was over. Not quite really. Only one of us, Tom, had ordered dessert. So we sat back and relaxed, chatting. But then it came. Oh, not just Tom’s dessert but four more. Jose had arranged to comp us one of each of four desserts for the table. Talk about wow factor! There were beignets, fried bananas, creme brulee trio, and warm Valrhona chocolate cake. At this point, all I could mumble were ‘wow’, ‘oh my’, and lots of ‘ah’s. My mouth is watering just imagining those again. Each dessert was rich and flavorful. Even with 8 of us, there was plenty to go around to sample. It made the meal perfect. The food was fantastic, the waiter the best, and even the manager stopped by. She welcomed us with a smile, and graciously accepted our compliments of Jose and the whole experience. Too soon it was time to rise and head out, but our stomachs were full as well as our minds with the heady experience. Needless to say, Jose got an incredible tip. Cheers Jose!! If you visit Vong’s Thai Kitchen in Chicago, may you find Jose waiting your table. Did you have any memorable food experiences in Chicago, especially at SOBCon08? The Guild’s first open meeting will be held on Saturday, May 10th at 1 p.m. at Benton Park Cafe, who is generously hosting our meetings. They have fantastic coffees and I’ve eaten and loved everything on their menu. All members of the Guild are highly encouraged to attend this first meeting – please RSVP within either the comments or on the appropriate thread in the forums. The Guild will discuss its first big project slated for this fall, among other issues. The meeting is open to non-members for a $5 admission fee. If you’re considering joining, this would be a perfect opportunity to see what we’re all about. We’ll also be accepting and registering new members before and after the meeting. See the original post on St. Louis Bloggers Guild to confirm your attendance. Should Bandwith Be A Commodity or is it already? Melody, at the St. Louis Bloggers Guild, challenges us with the idea that bandwidth may soon become a commodity. The position is reflective of the growing battle between ISPs and big business and the none business user. The much wrote about Comcast fiasco is but the most notable. The article contends that unless laws protecting net neutrality are put in place, many, including bloggers, may have more to think about than content alone. Bandwidth may become a business expense. I’d like to contend that for most full time bloggers, it already is. Many bloggers today aren’t just posting text. The age of video blogging and podcasts is upon us. Sure many of those files don’t have to be stored locally, but if not, and reliable hosting is required, the blogger ends up paying. The question is not will it become a commodity, but when will tiered bandwidth come into play. Telcos already have on and off peak hours for phone calls, and it would appear their current bandwidth strategy would take them along the same path. Why not charge more for high use during peak hours and a cheaper rate for off peak hours. Why not charge more for based on domestic versus international traffic. What’s to say that Comcast isn’t the only one already throttling bandwidth, and not just targeting file sharing. Melody is right, bloggers might be next, but I’m willing to bet for some ISPs, that sort of traffic guidance is already in play. If not at the ISP level, I’m willing to bet it’s already happening at many site hosting shops. Not just cap on total use, but speed based on what your sites content is. Is there a law that says you have to advertise all of your products? What’s to keep Dreamhost or other hosts from putting silent caps in place for blogs, and not for businesses? Okay, maybe I smell dark shadows type stuff here, but mark my words, it’s already happening on a larger scale than we know. Do go read the original article on the St. Louis Bloggers Guild. You can read more about the story on the St. Louis Bloggers’ Guild site, but I wanted to write a bit here as well. I’ll be plugging more of the guild’s events and get togethers as well. This party didn’t wait for your’s truly to show. Bloggers had already snagged us the best corner in the place, right by the DJ. Lights hadn’t even dimmed and folks were already getting into groups, with conversation flowing like water. Raquita and I cornered Jason Wall at one end for a while, while Bill Streeter and Dana held court at the other end. It was packed house as names you know and love in St. Louis blogging piled in. Soon there were beers, and burgers and appetizers in the mix, and then it got loud. As it got dark, the lighting of the place really kicked in. Even the disco ball was lit up. The noise and music picked up at the same and folks had to huddle close to be heard. This made it seems even more like friends gathered together. Of course there were heated discussions, lazy chats, and plan hatching. Rumors of future events were heard as well. Me? I’ve picked up some new viewpoints on religion, photography, and video blogging. I’m sure other’s got some interesting tidbits as well. And then there were cameras. I’d brought mine and several others brought their’s. I know Rebeccas, Raquita, Jason, Dana, and more had cameras in hand. Bill even snagged some shots with his iPhone. We grabbed a couple of us manly man together as well. Atomic Cowboy is a great venue for a get together, but the evening wasn’t without incident. One of our bloggers had their car broken in to. A few things were stolen but thankfully no one was hurt. The police showed up after the fact. It really puts a damper on things. To sum up, I had a great time, even being a wall flower sort myself. I took a few photos, which you’ll see on my Flickr stream first but some will be here and a few over at St. Louis Bloggers Guild. Blog much? Well then you need to hear about this. St. Louis bloggers are joining together to form a first of it’s kind guild. Writers have a guild, directors have guilds, so why not bloggers? St. Louis Bloggers Guild is already drawing attention, with write ups in the local media, as well as a swarm of bloggers looking to join. Why a guild? What’s it got to offer over something like a blog carnival or an online only blogging community? The St. Louis bloggers Guild is not just about posting all on the same topic, or giving each other a pat on the back, though it can do that too. It’s about informing, promoting, protecting, and yes, connecting. Sound interesting yet? The guild isn’t just about putting fingers to keys, and putting up the posts, it’s about forming a real community. Not just faceless nicknames anymore, but folks you get to know in a real way. There will be parties, conferences, blogging fests and more. Yes even beer on occassion. I mean heck, we are St. Louis, home of Budweieser! St. Louis bloggers won’t be hemmed in either. This isn’t about corralling folks and making them get in line. It’s about a community hub, and it will take all types. There’ll be blogs about St. Louis involved, and blogs about parenting, blogs about tech, and blogs about camping, even blogs about cupcakes. So what’s stopping you from signing up today? Hey, you can go visit the main page here, or go right to joining up here. Want just a bit more incentive? How about joining several of us for a little mixer this Saturday night? Yep, come meet some of us face to face and share a drink or an appetizer. It’s a party at Atomic Cowboy in St. Louis. The short story is be there at 6:30 PM. We’ll be the ones chatting it up and acting like bloggers. Please come out and show your support or if you can’t make it, do drop by the guild website and visit. I walked in to Kaldi’s in Kirkwood and immediately found the group of clubbies. They were right inside the door and already chatting. Tables had been rounded up, chairs brought around and folks where already exchanging emails and blog links. My kind of people. Soon a group of five turned to ten and then over a dozen were on hand. Relocating was not an option. As an aside, you could tell the regular coffee drinkers; they were quick to visit the counter and get seated back with their steaming cups. Everyone there was involved in blogging in some way. I’ve linked there here, courtesy of Brandstorming. Note that only one blog link is provided for each person, though several of us have more than one blog. A couple of these folks are becoming more than just acquaintances by now, but there rest were all new faces to me. Unfamiliar faces didn’t put a damper on the conversation though. It was nonstop talking from minute one and out to the cars. We did the typical go around the room bit, but that is not to discount it as of no value. Introducing ourselves really lead to more conversations and connections, and talks of investing in each other. I mentioned in a post earlier today that I wasn’t sure what my take away for new contacts would be, but let me assure you, this group was all worthy of my attention. Each brought a different perspective and attitude to the table. (tables – 8 of them) It will be difficult to pass up adding all of these new faces and inputs to my daily feeds. I don’t have my pictures up yet, but when I do, they’ll be at my Flickr account and tagged with smcstl. Please check out the blogs above and give them some love. Also, let us know about your local social media club meetups.